0Build interactive, database-driven websites with PHP 7, MySQL 8, and MariaDB. The focus of this book is on getting you up and running as quickly as possible with real-world applications. 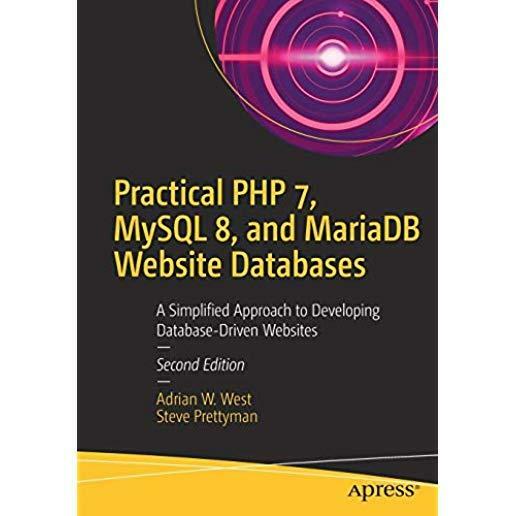 In the first two chapters, you will set up your development and testing environment, and then build your first PHP and MariaDB or MySQL database-driven website. You will then increase its sophistication, security, and functionality throughout the course of the book. The PHP required is taught in context within each project so you can quickly learn how PHP integrates with MariaDB and MySQL to create powerful database-driven websites. Each project is fully illustrated, so you will see clearly what you are building as you create your own database-driven website. You will build a form for registering users, and then build an interface so that an administrator can view and administer the user database. You will create a message board for users and a method for emailing them. You will also learn the best practices for ensuring that your website databases are secure. Later chapters describe how to create a product catalog, and a simple e-commerce site. You will also discover how to migrate a database to a remote host. The final chapter will demonstrate the advantages of migrating to Oracle's MySQL 8. You will be shown step by step migration directions along with a demonstration of the tools available in SQL Workbench. Because you are building the interactive pages yourself, you will know exactly how MySQL, MariaDB, and PHP all work together, and you will be able to add database interactivity to your own websites with ease.